Resolute’s business and sustainability strategies are interdependent. Our company’s vision, our corporate values and the way we do business every day reflect our commitment to sustainability. The latest example of our approach is that Resolute and Serres Toundra, the largest greenhouse complex in Quebec, have joined forces with CO2 Solutions to reduce carbon emissions at our Saint-Félicien pulp mill and reuse captured CO2 at the adjacent greenhouse. This first-of-its-kind initiative in our industry is not only good for the environment, but will also lead to significant economic and social benefits in the Lac-Saint-Jean region. CO2 Solutions is leading the way in meeting the challenge of reducing climate change causing carbon dioxide (CO2) emissions. Through its patented technology, this Quebec-based company specializes in the field of enzymatic CO2 capture and has been actively working to develop and commercialize this new technology as a viable CO2 mitigation tool. Formed in 2014 as a partnership between Resolute, the city of Saint-Félicien and local investors, Serres Toundra is a 34-hectare greenhouse complex located adjacent to Resolute’s mill. 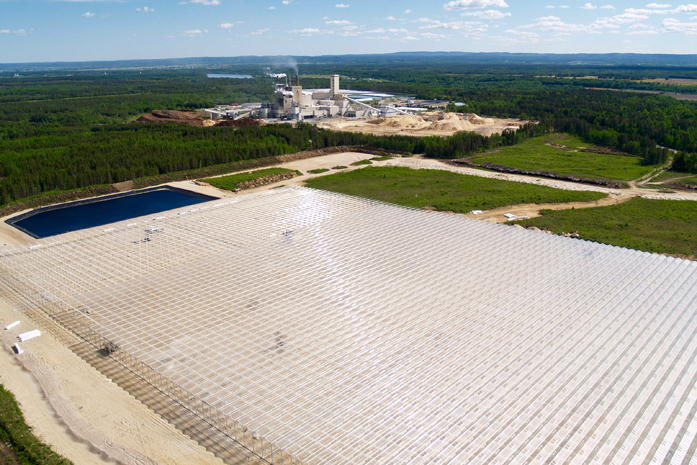 This C$100 million project will, when fully operational in 2019, be the largest greenhouse in Quebec, produce vegetables 12 months a year and contribute 400 jobs to the Lac-Saint-Jean region. Please refer to the Resolute and CO2 Solutions news releases for more information on this innovative project.